Old City is the touristic heart of Philadelphia, where you'll find the Liberty Bell, Independence Hall, the Betsy Ross House, Ben Franklin's workspace, the President's House, and much, much more history. Thanks to some gurus in interpretive culture, this history is kept very much alive, modern and relevant to a 21st century visitor (and even the children!). But as Philadelphia marketing professionals really want you to experience, Old City is much more than interactive Colonial re-enactments and period pub tours. 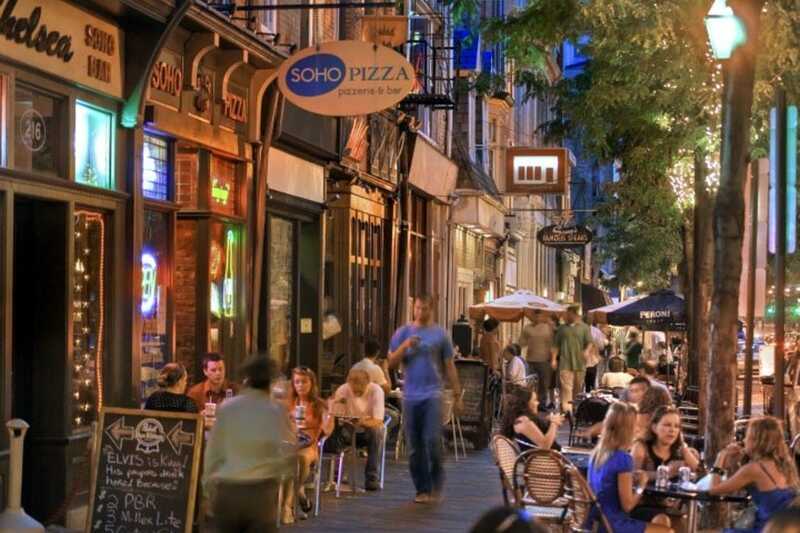 In fact, Old City is one of the most vibrant neighborhoods in the region, home to sophisticated art galleries, funky boutiques, outdoor cafes and some of the best nightlife in the city – all infused with that unmistakable 18th century charm. Some of the nation's most significant historical figures are buried at this beautifully preserved 17th century graveyard that's attached to an Episcopal church used for worship by many of the country's most prominent early patriots. Ben Franklin and his family are buried here at the Christ Church Burial Ground, as are four signers of the Declaration of Independence, the founder of the nation's first zoo, the "Father of American Psychology," and many more. Tours are offered every day and are sometimes themed according to profession or wartime service. In Old City, there's often some Revolutionary history hiding even where you don't expect it. At Revolution House, a Colonial-era Quaker Friends Meetinghouse has been transformed into a circa 2011 bar/restaurant, where the food is creative comfort food Italian but the decor is quintessentially USA. An American flag that graces one wall is constructed from reclaimed Lancaster pine, vintage keys are inlaid into custom concrete tables and an eagle forms the centerpiece of a mammoth staircase chandelier. Brunch is served on weekends, domestic craft beers are on the taps, and there may be no better seat in Old City than on the rooftop, where you can watch a weekly fireworks display in the summer. The Arden Theatre is a full-service professional regional theater company that produces a wide variety of theatrical performances, from children's musicals to nonfiction dramas. The main theater seats 360 and a studio theater seats 175. There's also classroom and rehearsal space, as well as a community room for receptions. Since the creation of the Barrymore Awards for Excellence in Theatre in 1995, the theater company has received 250 nominations and 53 awards. The European-style Penn's View in the heart of Old City Philadelphia is charming. Dating back to 1828, the non-smoking inn is within walking distance of historic sites, live theater and galleries. Guestrooms feature queen beds, private bath with plush terry robes, and cable television; some have a Jacuzzi tub and fireplace. Complimentary morning newspaper and continental breakfast are provided. A wine bar and excellent Italian restaurant are located on-site. Event space for small groups up to 60 people. 52 rooms. Moderne Gallery centers its energies primarily on sourcing pristine French Art Deco furniture and accessories, and maintaining the most comprehensive selection of Nakashima furniture anywhere in the US. This is upscale retro, designer retro, if you will. You can also find some stunning American Craft Movement pieces from Wharton Esherick, David Ebner and Sam Maloof, and string paintings by David Roth. It's almost like browsing through a museum.